Beautiful footage of marble quarrying in Italy, a trailer for the film, Il Capo, by Yuri Ancarani. The filmaker spent a year visiting the quarries of Carrara Italy and decided to focus on the delicate choreography between the foreman, the machinery, and the monolithic blocks of stone. I would love to see the full length movie in person on a big screen. Video about a great project, Wildflowering L.A., by Fritz Haeg. 50 sites throughout the Los Angeles area were seeded with native wildflowers. The sites were also given signage inspired by forest service and park service aesthetics to announce the project and communicate to people that the ‘wild’ look of the wildflowers was deliberate. It would be nice to see something similar done in the Bay Area. There’s a timelapse of one of the sites here. 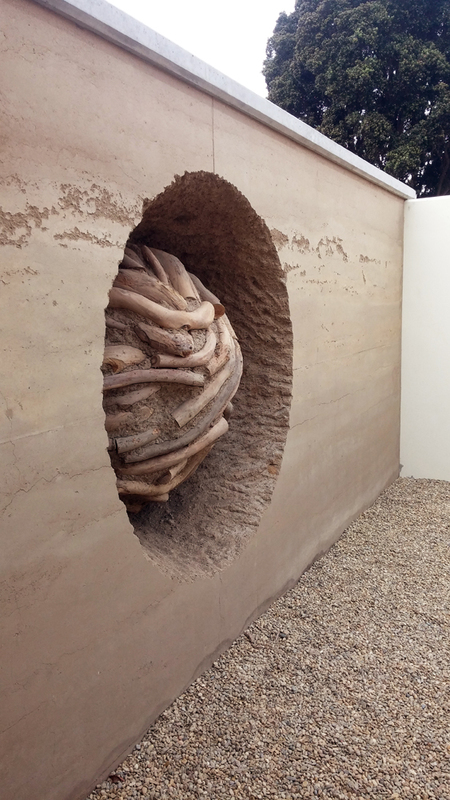 … and back to posting about Andy Goldsworthy projects. He has a new wall at the Presidio in the Officer’s Club. 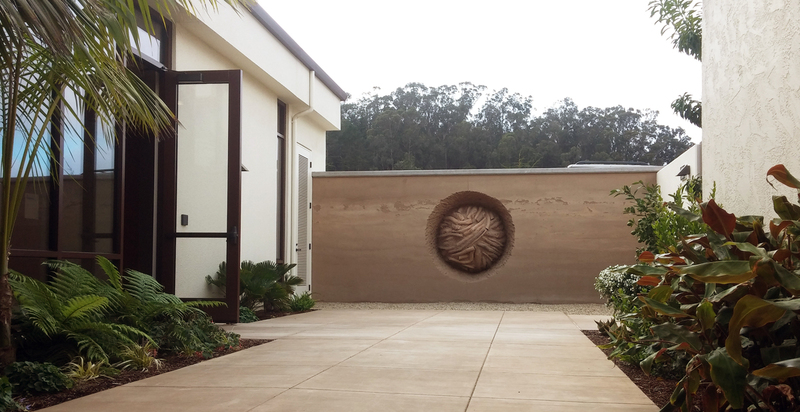 He built a rammed earth wall with a half sphere of eucalyptus branches buried inside, then chipped away the wall to reveal the sphere. From a distance it has a nice graphic look, like a bas relief, and up close you can appreciate the method of construction. I haven’t seen this done before, but it’s simple and effective and seems replicable for a residential garden. It sometimes seems like a cliche to be a stoneworker and love Andy Goldsworthy’s work, but I need to just embrace the fact that he’s really good and does things exactly to my taste. There a short video and photos of him posing by the wall here. The Making of Wurrungwuri – Short Documentary from Brain in Hand Productions on Vimeo. 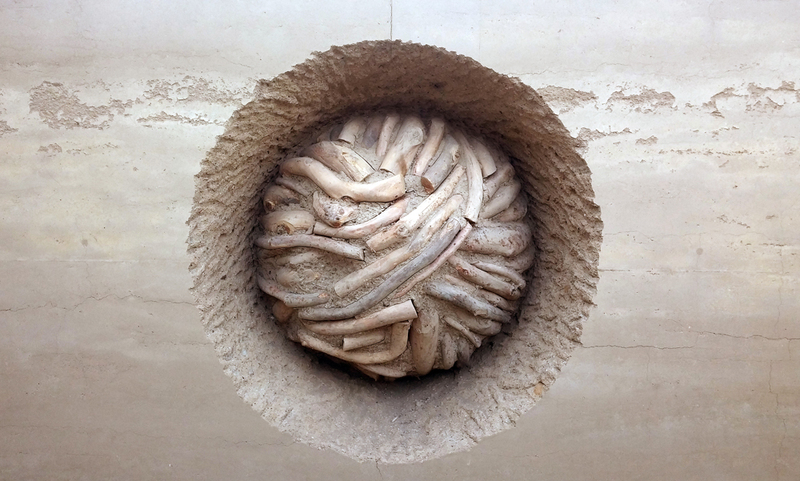 Two posts ago, I said Andy Goldsworthy (to his credit) might be over-represented in the stonework videos I find on the web and sometimes re-post here on this blog. So here’s a video of another artist who works with stone, Chris Booth from New Zealand. A lot of his work involves stone supported by a steel armature. 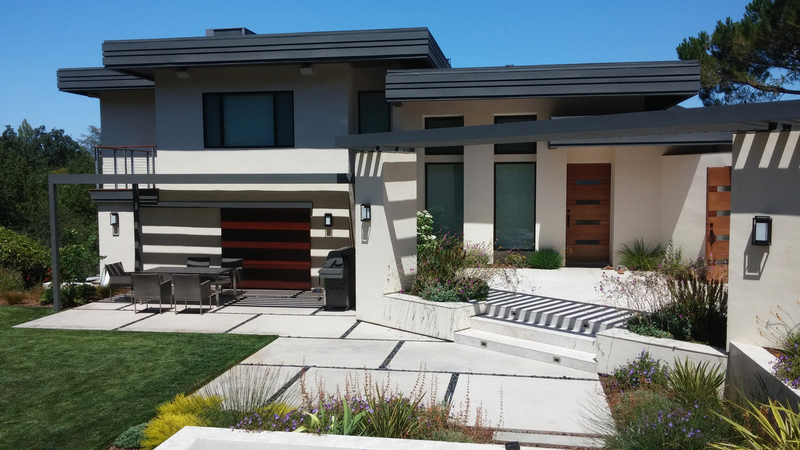 I sometimes struggle to fully appreciate stone that is used that way — I’m more inclined towards things like his dry-stacked homage to New Zealand’s sea stacks — but I always find it intriguing. I’d need to see this sculpture, Wurrungwuri, in person to really judge it, but a great deal of intent and technical skill obviously went into its creation. There’s info about the design and the construction at the website for the project. 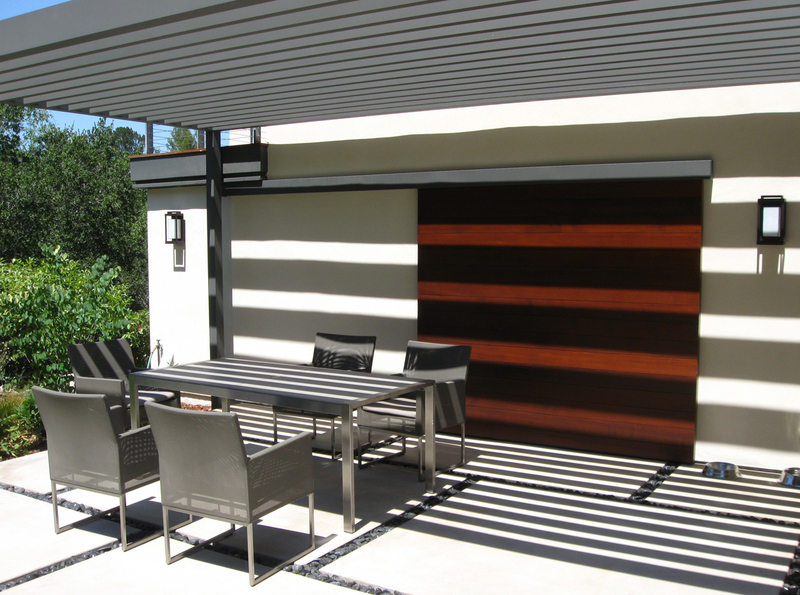 A little while back I took some photos of the cast shadows from a pair of pergolas we designed last year. The pergolas are made with rectangular aluminum tube, a little different from most of what I show on this blog, but it still follows the underlying aesthetic of my drystone work. The way the two pergolas overlap echoes the overlapping roof lines of the house, the house’s best feature, but it also overlaps the way stone in a drystone wall is supposed to overlap. Similarly, the rectangular concrete paving has the broken joints of a drystone construction. 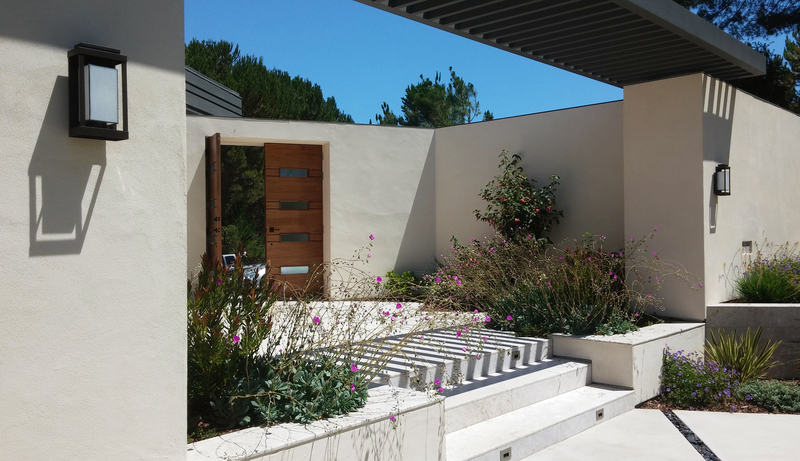 Even when I’m not designing with stone, I like to see things follow the drystone rules. There is some stonework in this garden, but it’s not drystone and it’s built by another contractor, not by me. You can’t see it so well in the high-contrast mid-day lighting that was creating the shadows, but the courtyard has a limestone veneer, large thin slabs that are machine-cut and honed and installed with an adhesive instead of mortar and with a rubber crack-isolation layer (nicely explained in a patent application) between the stone and the underlying concrete slab. The stone has an interesting patterning and nice color variation; I’ll probably photograph it in softer light at some point after the planting has grown in. For now, though, I’m happy with the way the cast shadows affected the landscape. 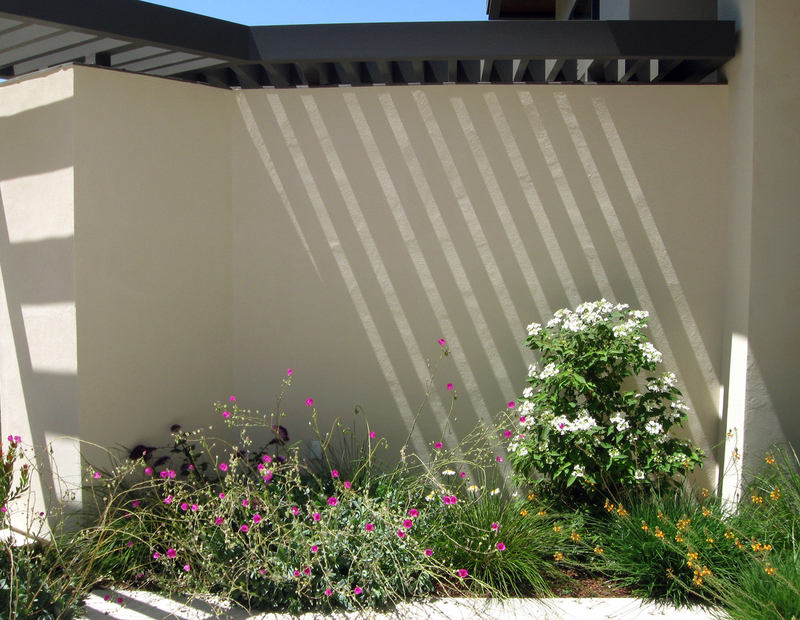 The shadows on the door and on the courtyard steps were expected, but this raking line across the wall was a bonus. A couple of before photos are below. Arches- Andy Goldsworthy (Frederik Meijer Gardens & Sculpture Park) from Dog & Pony Communications on Vimeo. Almost fifteen years after Rivers and Tides, I wouldn’t mind seeing someone other than Andy Goldsworthy starring in a video about a dry-stone project. But it’s a tribute to his work and his uniquely charismatic persona that if you see a video about interesting stonework, there’s a good chance it will feature him. This video has some good footage of the construction of a large dry-stone arch constructed for a sculpture park in Michigan. Dry-stone arches are always compelling and this one is the biggest I’ve ever seen. There’s video of another of his arch projects, built for a sculpture farm in New Zealand, here. You are currently browsing the DryStoneGarden blog archives for October, 2014.